There's no prizes for guessing what this unimaginatively and badly titled little game is all about, and if you said it's a karting game, you'd be first in line to claim a non-existent reward. 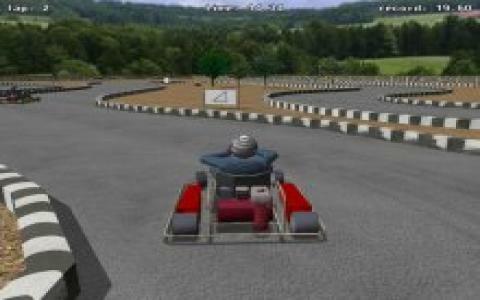 This one jumps on the bandwagon created some years earlier by Mario Kart but instead of the fantasy-style trappings of this classic, KartingRace takes a more realistic approach as adopted by others in this specialist genre such as International Karting. The player is greeted with a decent range of options upon firing up the game, with the usual suspects such as various engine and race types to choose from. Once you get into the game properly, you're met with a surprisingly decent little game, which actually does a pretty good job of recreating the thrills and spills of the karting scene. It's a far cry from the likes of Formula One racers like Formula One 99 but which is nevertheless enjoyable stuff. There's a good range of tracks to explore and the computer opponents put up a good challenge, while the karts themselves handle realistically and which require a completely different touch than most driving games. The tracks are also imaginatively designed and genuinely exciting to speed around, with a good sense of speed, with graphics that are nicely detailed and generally easy on the eye. Controls too are intuitive and responsive and which help make the game easily accessible to anyone, even if they have never played such a game before. Poor title aside, KartingRace is actually an enjoyable and exciting racer so if you are looking for something a little different, check it out.